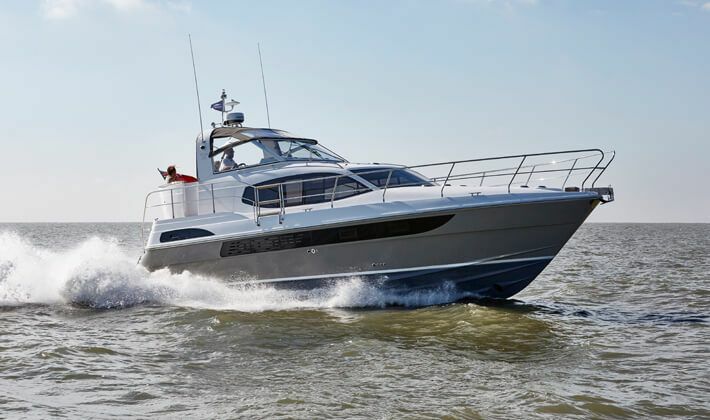 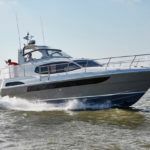 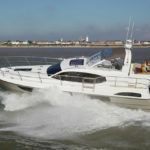 The flagship of the Haines fleet offers the choice of two hull designs, semi displacement or medium vee planing. 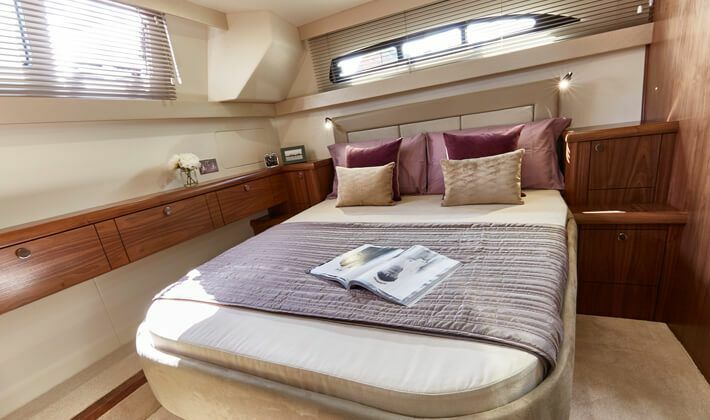 Above deck level both boats are identical & offer accommodation for either 6 or 8. 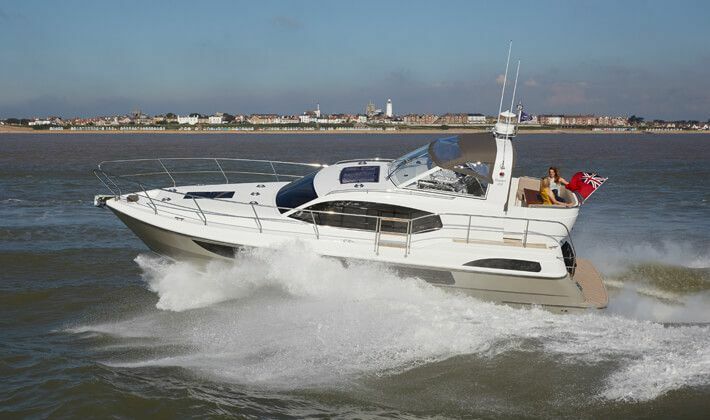 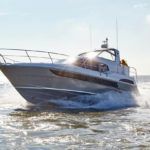 The semi-displacement 400 is available with single engine installation whilst the planing 400 provides a plus 30 knot performance with the larger twin engine options. 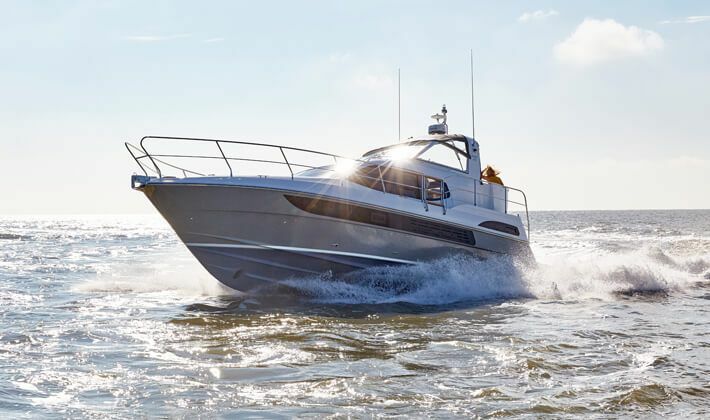 Whichever hull design you choose, space and light come as standard. 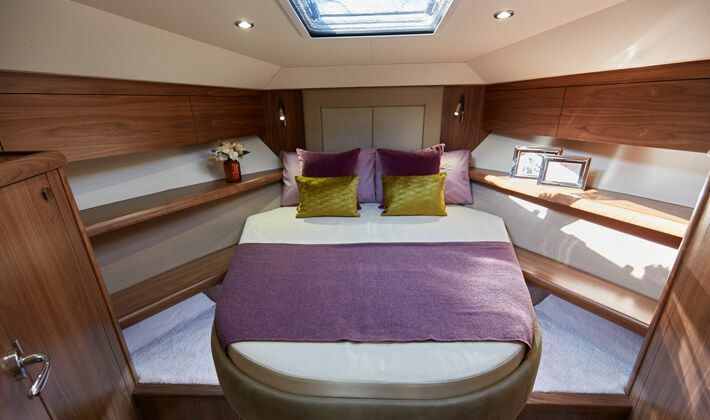 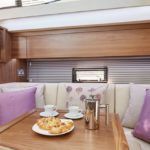 Forward guest stateroom cabin with an island double berth and two drawers below, hanging lockers to both port and starboard, eye-level storage lockers and shelving beside berths. 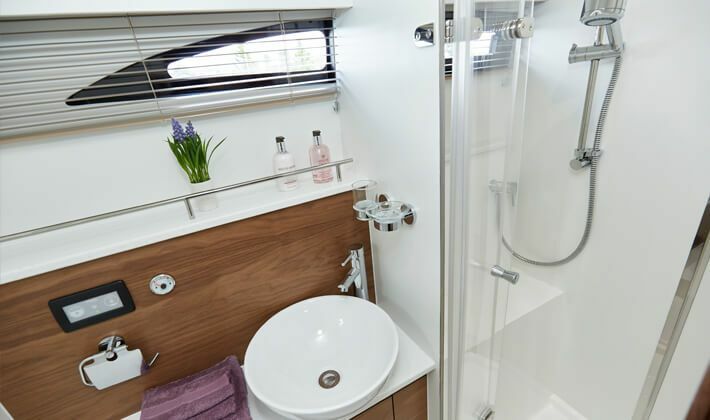 En-suite forward toilet to starboard with sea toilet to holding tank, ceramic basin and mixer tap, eye-level storage locker, solid surface shelving and flooring. 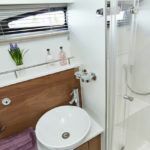 En-suite forward shower to port with solid surface shelving and flooring, shower seat and eye-level storage locker. 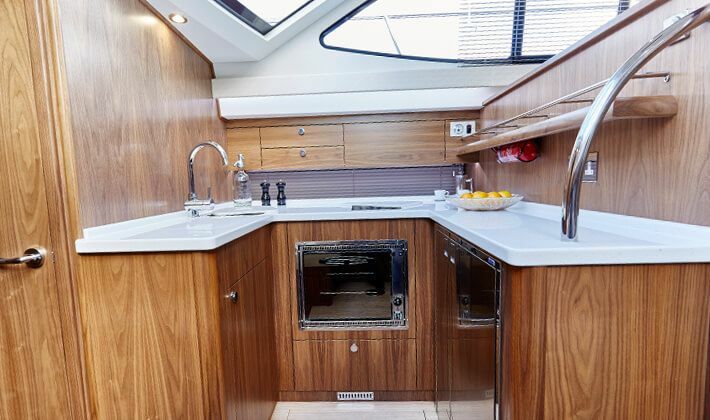 To starboard, 3-burner gas hob with glass cover or recessed under worktop 2-burner hob, stainless steel gas oven and grill. 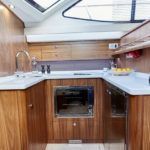 Drawer and cupboards under, twin sinks with mixer tap, large stainless steel fridge freezer, eye-level locker, drawers and shelf outboard. 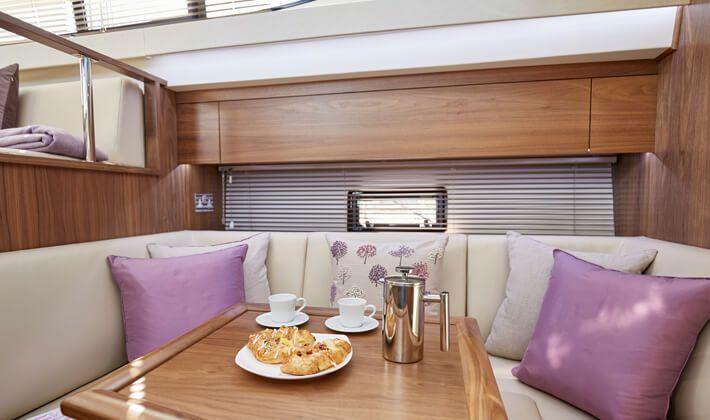 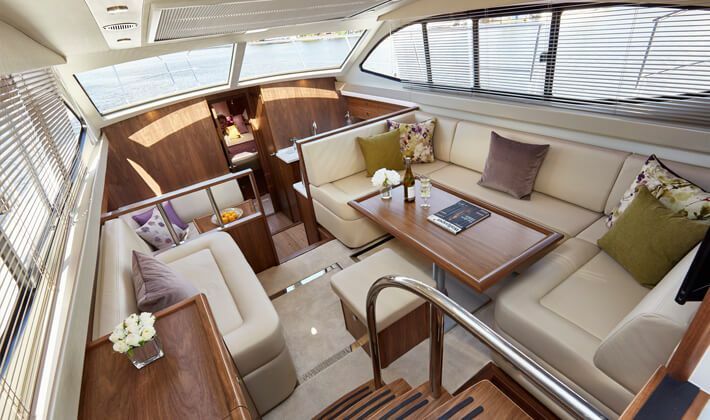 Split level saloon with lower seating area on portside opposite galley, U-shaped settee arrangement with drawers below, fixed table, eye-level locker and shelf outboard. 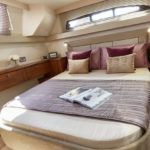 U-shaped settee to starboard converting to double with storage under (option of full double domestic sofa bed arrangement), 2-seater freestanding settee to port, full length cupboard / cocktail cabinet, stairs to aft deck, large hi/low rectangular table to comfortably accommodate 6 diners. 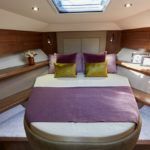 Stateroom cabin with a large island berth across the boat, dressing table with three drawers along the transom making the most of the light and the views from the aft panoramic screens with its two opening flush hatches onto the bathing platform, two separate hanging lockers, bedside lockers and drawers either side of the double berth. 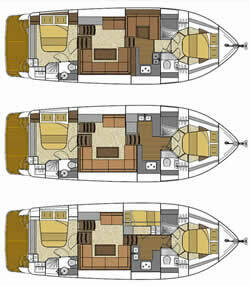 Helm to starboard, dash with full engine instruments, easy-fold clamshell style forward canopy, deck seating and dining arrangement with cushions, deck storage lockers below, gas locker, folding teak table with fixed base, helm and navigator seats (option of helm box seat for additional storage), storage to port with double doors, recess locker to starboard accommodating horseshoe life ring. 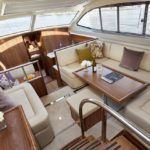 Port and starboard transom steps to large bathing platform and swim ladder.